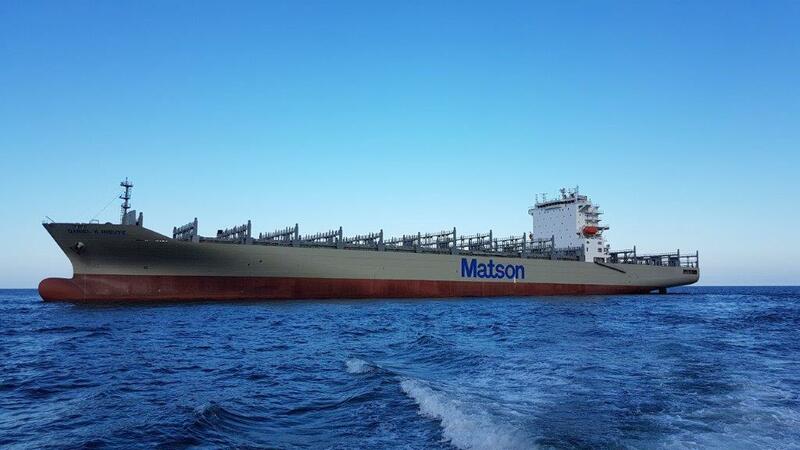 Tankers--Cargo-FPSO - LamaLo Technology Inc.
​CV-3600 Philadelphia Class Vessels (Matson Aloha Class) are under construction at Philly Shipyard for Matson Navigation Company, Inc. The new vessels will be equipped with dual fuel engines that have liquefied natural gas (LNG) capability. The 850-foot long vessels will be the largest Jones Act containerships ever constructed and are designed to operate at speeds in excess of 23 knots. The single-screw vessels will be powered by a 38,000 kW 7-cylinder slow speed diesel engine. LamaLo Technology has been contracted to provide shafting alignment, vibration and powering analysis, measurements and assessment. The vessels are scheduled for delivery in 2018. 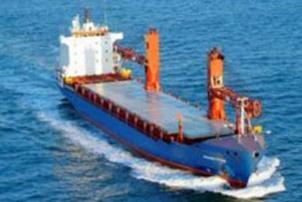 VT Halter Marine Inc. is building two LNG-powered ConRo ships for Crowley. These double-hulled ConRo vessels are designed to travel at speeds up to 22 knots. The ships will be 219.5 meters long, 32.3 meters wide (beam), have a deep draft of 10 meters, and an approximate deadweight capacity of 26,500 metric tonnes. Cargo capacity will be approximately 2,400 TEUs, with additional space for nearly 400 vehicles. The vessels will have a single screw propeller configuration. The 5 bladed fixed pitch propeller will be directly driven by a dual-fuel engine rated at 26,160 kW at 91 RPM. LamaLo Technology has been contracted to provide shafting alignment, vibration and powering analysis, measurements and assessment. The first vessel completed sea trials successfully ​in 2017. 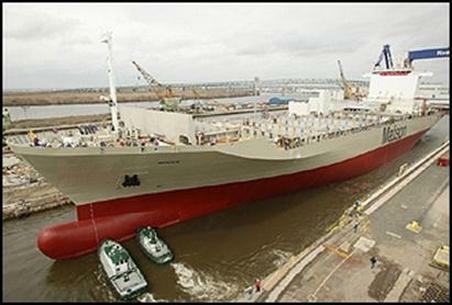 Eight (8) MT-50 Class product tankers were constructed at Philly Shipyard Inc. (PSI). The vessels are 183 m long, have a dead-weight of approximately 50,000 metric tons and are powered by an 8,200 kW slow speed diesel engine. This Class is based on a Hyundai Mipo Dockyards (HMD) design which incorporates numerous fuel efficiency features, flexible cargo capability, and the latest regulatory requirements. The propulsion shaftline is approximately 20.8 m long, and is supported by one stern tube bearing and one intermediate shaft bearing. LamaLo Technology was contracted to provide shafting alignment, vibration and powering analysis, measurements and assessment. All eight tankers have been delivered. There have been no issues with the propulsion shafting alignment, vibrations or bearings. ​General Dynamics NASSCO constructed eight, 50,000 deadweight ton LNG conversion ready, product / chemical carriers for American Petroleum Tankers and SEACOR Ocean Transport. The double-hulled ships are 186 meters in length and 32.2 meters in beam, with a design draft of 11 meters and a target operating speed of 14.5 knots at 75% MCR. The vessels have a single screw propeller configuration which is directly driven by a diesel engine rated at 7,700 kW. The propulsion shaftline is approximately 22.8 m long, and is supported by two sterntube bearings and one intermediate shaft bearing. LamaLo Technology has been contracted to provide shafting alignment analysis, measurements and assessment. All eight tankers have been delivered. There have been no issues with the propulsion shafting alignment or bearings. 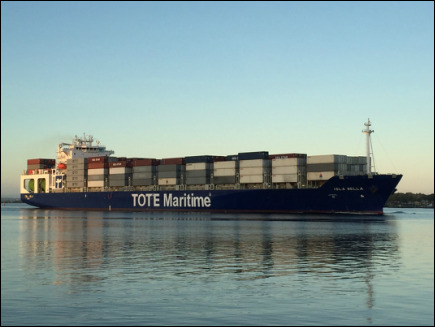 General Dynamics NASSCO constructed two 3,100 TEU Liquefied Natural Gas (LNG) powered containerships for Totem Ocean Trailer Express (TOTE), Inc. The double-hulled ships are 233.0 meters in length and 32.2 meters in beam, with a design draft of 10.5 meters and a target operating speed of 22.0 knots. The vessels have a single screw propeller configuration which is directly driven by a slow speed dual-fuel engine rated at 25,191 kW at 104 RPM. The propulsion shaftline is approximately 34.5 m long, and is supported by two sterntube bearings and one intermediate shaft bearing. LamaLo Technology was contracted to provide shafting alignment analysis, measurements and assessment. Shaft alignment was conducted using the strain gauge technique. Since both vessels have been delivered there have been no issues with propulsion shafting alignment or bearings. 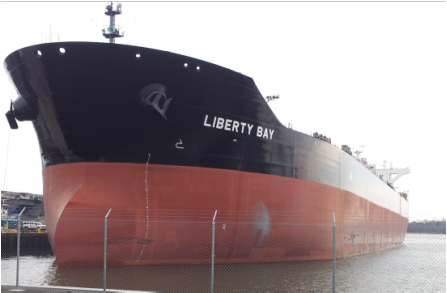 ﻿Two (2) Liberty Class MT115 tankers were constructed at Philly Shipyard Inc. The vessels have a deadweight of approximately 115,000 metric tons are powered by a 6 cylinder 13,560 kW slow speed diesel engine. The propulsion shaftline is approximately 16.6 m long, and is supported by one sterntube bearing and one intermediate shaft bearing. ﻿ LamaLo Technology was contracted to provide shafting alignment, vibration and powering expertise. Since both vessels have been delivered there have been no issues with propulsion shafting alignment or bearings. 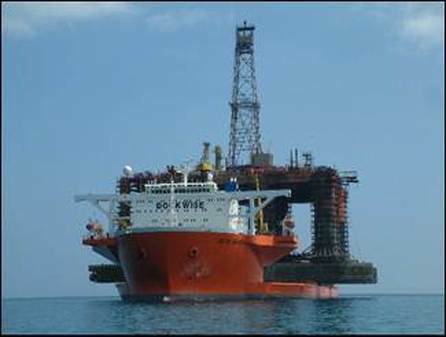 The SeaRose is a Floating Production, Storage and Offloading (FPSO) vessel that was purpose-built for opera﻿tions at the White Rose offshore oil field located about 350 km east of St. Jo﻿hn’﻿s Newfoundland, Canada. The SeaRose has an overall length of 267 m. The box-shaped double-skin hull has a 46 m moulded breadth and a 27 m moulded depth. She has a design draught of 18m, a 127,000t deadweight and a displacement of 187,100t. The SeaRose has a twin screw controllable pitch propeller configuration, each driven by a diesel engine with a rating of 7800 kW at 500 RPM, through a single reduction. The sterntube seals were found to be leaking shortly after delivery. LamaLo Technology Inc. (LLT) was contracted to determine the source(s) of the seal leakage, review and assess the propulsion shafting alignment, and develop realignment procedures. The SeaRose was towed to Belfast, Ireland in June 2012 for repair/replacement work on the bearings seals and shaft realignment. LamaLo Technology was contracted to ensure that the installation of the bearings and shafting system was satisfactory and for final alignment. Work was completed early July 2012. The SeaRose returned to service without incident. The vessel has an overall length of 188 meters, a beam of 32 meters and a ﻿design draft of 11 meters with a total cargo capacity of approximately 330,000 barrels in 12 tanks. Mid-Ocean Tanker Company LLC (MOTC) contracted LamaLo Technology Inc. (LLT) to provide specialized engineering analysis and measurement services with respect to the propulsion shaft alignment and vibration. The primary objective of the LLT work was to ensure the propulsion shafting system had an acceptable alignment condition, and was free of excessive vibrations, in all modes of operation. This was accomplished by a combination of theoretical modeling, design review and assessment, and on-site measurements. The vessel has twin screw propeller configuration. Each of the 4 bladed fixed pitch propellers will be driven by a 4650 kW electric motor through a single reduction gearbox. The propulsion shaftline length is about 87' (26 m) long, and is supported by a strut, a sterntube and a lineshaft bearing. The main gear shaft is supported by two bearings. The motor rotor shaft is supported by two bearings and is connected to the gearbox via a gear coupling. LamaLo Technology Inc. (LLT) was contracted to assist in the propulsion shafting design and conducted the corresponding alignment and vibration analysis as well as shafting vibrations and powering measurements during sea trials. The vessel was delivered in 2012. The MV Mighty Servant 3 (MS3), a semi-submersible heavy lift ship, was built in 1984. 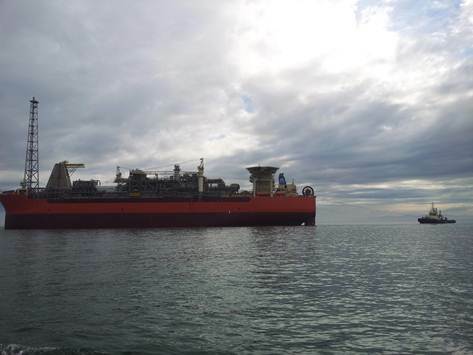 The vessel has an overall length of 181 m, a breadth 42 m and a depth of 12 m. In December 2006 the Mighty Servant 3 transported a large offshore oil rig to Luanda, Angola and then encountered a problem offloading it. The ship began to flood and then sunk in 62 m of water. 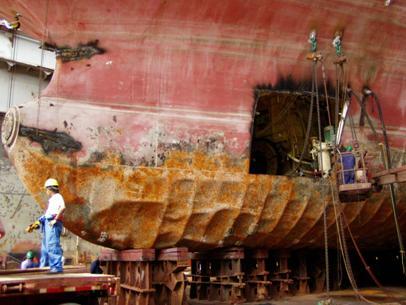 Grand Bahama Shipyard Ltd won the contract to re-instate the vessel. The gearboxes, engines and generators were removed & refitted after overhauling as were the propeller and motors. 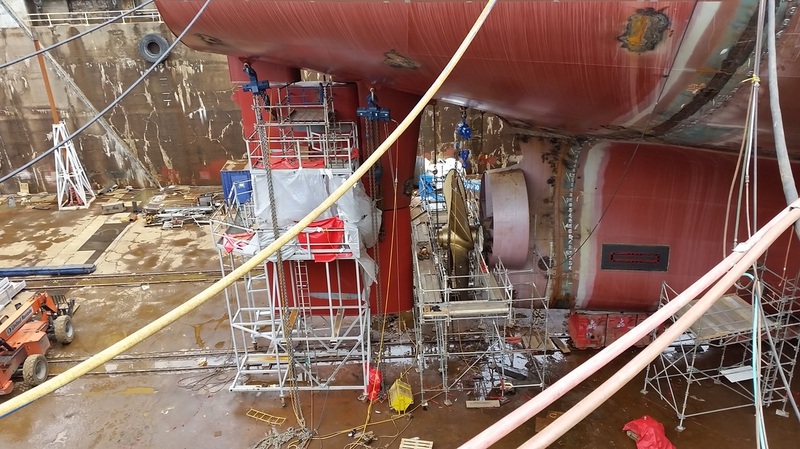 LamaLo Technology Inc. was contracted by the Grand Bahama Shipyards Ltd. to provide Specialized Engineering Analysis and Measurement services with respect to the propulsion shaft alignment and installation during the repair of the MS3. The MS3 has a twin screw controllable pitch propeller configuration, each driven by two 6,000 V propulsion motors, each with a rating of 3100 kW at 890 RPM, through a double-input single-output reduction gearbox (5.92:1). Each propulsion shaft is about 15 m long and is supported by two sterntube bearings, and one intermediate shaft bearing. The gearbox output shaft is supported by two bearings and the motor rotor shafts are each supported by two bearings. Electric power is provided two (2) diesel engines driving 6000V main propulsion generators through spiroflex couplings. The shafting, motors, and gearboxes were repaired, installed and aligned successfully. The MS3 returned to service the summer of 2009. 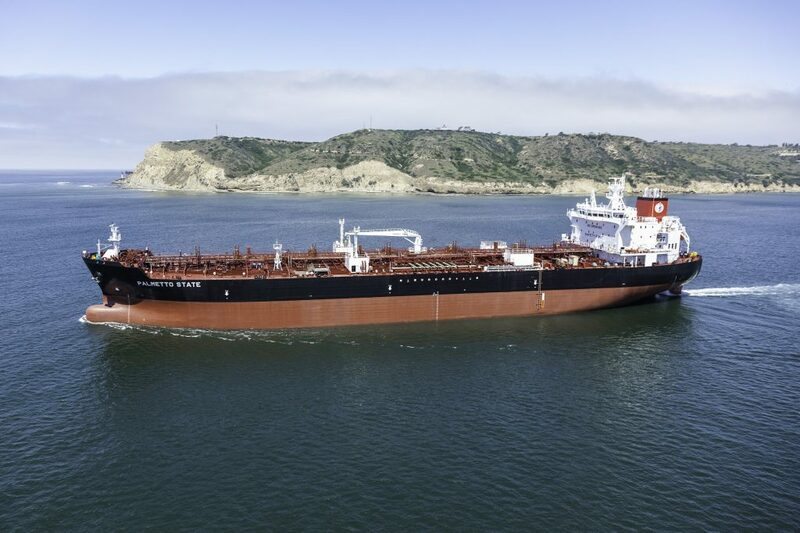 Built at Aker Philadelphia Shipyards, these 46,000-dwt double-hull ships are 183 meters long, 32 meters wide and have a cargo capacity of 330,000 barrels. The tankers’ design is being provided through an exclusive five-year agreement with Hyundai Mipo Dockyard (HMD). The vessel has a single screw propeller configuration. The 4 bladed fixed pitch propeller is directly driven by a MAN B&W 6S50MC diesel engine with a rating of 8,700 kW (11,640 HP) at 127 RPM. The propulsion shaftline is approximately 14.5 m long, and is supported by two sterntube bearings and one line shaft bearing. Propulsion shaftline theoretical alignment and lateral (whirling) vibration analysis, as well as strain gauge alignment measurements were conducted. Strain gauge alignment measurements were taken both on dock and when afloat, to determine the affect on shaft alignment of undocking and the requirements for chocking the main engine prior to floating the hull. 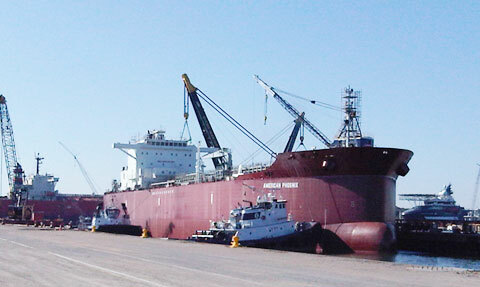 The first vessel MV Overseas Houston was delivered the first quarter of 2007. Subsequently nine (9) vessels have been delivered. The propulsion shafting and engine alignment performance has been reported to be excellent. 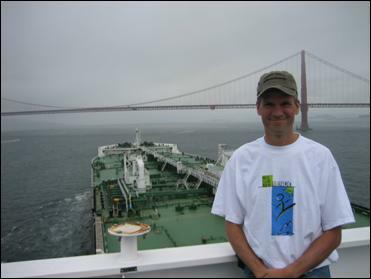 The MV Mississippi Voyager (Voyager) is a double-hulled petroleum product tanker. The vessel was built 1998 by Newport News Shipbuilding, with a gross tonnage 30,400 and a deadweight of 46 MT. The vessel has an overall length of 183m, a moulded breadth of 32m, a design draft of 11.2 m and a rated speed of 14.5 knots. The Voyager has a single screw propeller configuration. The fixed pitch propeller is driven by a MAN B&W 6L60MC slow-speed diesel engine with a rating of 7,941 kW at 96 RPM. The propulsion shaftline is approximately 14.7 m long, and is supported by one aft sterntube bearing and one intermediate shaft bearing. The aft sterntube seal and sterntube bearing were both found to be damaged during an inspection in the spring of 2007. The propeller shaft was removed and the sterntube bearing was inspected and replaced. LamaLo Technology Inc. (LLT) conducted a failure investigation that included a shafting system design review, theoretical alignment and whirling vibration analyses, on-site inspections, strain gauge alignment measurements and shafting vibration measurements. 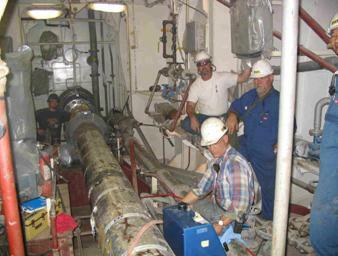 Realignment of the sterntube bearing was conducted in 2009. No further failures occurred. The sterntube bearings were found to be in excellent condition in 2013. The MV Marielle Bolten (Bolten), a 19,354grt & 1130 TEU general cargo/container ship, was built in 1997. The vessel has an overall length of 181 m with a moulded breadth of 26 m and a rated speed of 14 knots. The single fixed pitch propeller is driven by a MAN B&W 5S50MC slow-speed diesel engine with a rating of 6400 kW at 120 RPM. The propulsion shaftline is approximately 11.7 m long, and is supported by two sterntube bearings and one line shaft bearing. There is a shaft generator fitted aft of the main engine. 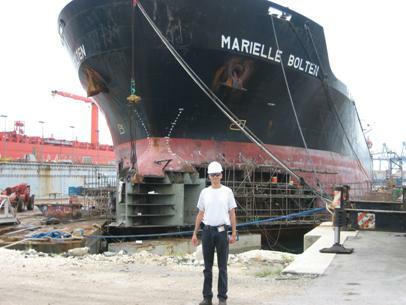 On 24 January 2006 the MV Marielle Bolten grounded in poor weather conditions and the hull and propulsion shafting were damaged. Grand Bahama Shipyard contracted LamaLo Technology Inc. to assist in the shafting realignment during and after the repair work. A theoretical analysis of the propulsion shaftline alignment was conducted and shaft alignment procedures were developed. The final propulsion shaftline alignment was conducted using the strain gauge technique. The repaired vessel was delivered in early 2007. The propulsion shafting and engine alignment performance has been reported to be excellent. 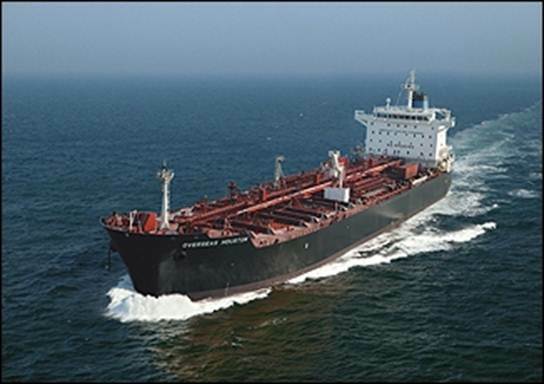 The MV Caribe Merchant was built in 1984, and is a 160 m long Roll-on/Roll-off Carrier, with a gross tonnage of about 15,400 and a dead weight tonnage of 9,200. The single four bladed controllable pitch propeller is driven by one diesel engine with a rating of 4,900 kW at 500 RPM, through a single reduction gearbox. The propulsion shaft is approximately 10.7 m (35') long, is supported by two sterntube bearings and is connected to a CPP Hydraulic Cylinder with a flanged sleeve coupling, which is then connected to the main gearshaft also by a flanged sleeve coupling. A failure of the aft main gearshaft support bearing occurred in 2006, and damage occurred to the pinion. The gearbox was also repaired and realigned after a previous failure in 2004. LamaLo Technology Inc. (LLT) was contracted to provide specialized engineering analysis services with respect to the propulsion shafting alignment and investigation of the gearbox failures. A theoretical alignment and whirling vibration analysis of the propulsion shaftline was conducted, and the installed alignment condition was measured using the strain gauge technique. The initial measured loads on the main gearshaft bearings were found to be excessive, and it was determined that this misalignment would result in failure of gearing components. To achieve an acceptable alignment condition the gearbox was lowered about 5 mm. The resulting bearing loads and all alignment criteria were satisfactory. 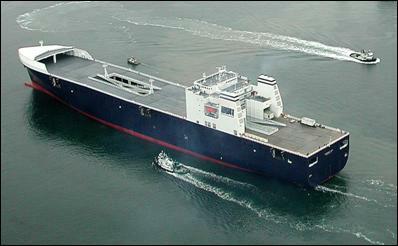 The ship returned to service in December 2006 and has been in service without any further failures. Two of these vessels were built at National Steel and Shipbuilding Company (NASSCO), MV Midnight Sun and MV North Star. They are 839' long with a beam of 118', a draft of 32', and a displacement of 45,400 long tons. Each of the 5 bladed fixed pitch propellers are driven by an Electric Motor rated at 19,750 kW (26,465 HP) at 125 RPM. Each propulsion shaftline is approximately 57 m (187') long, and is supported by two sterntube bearings, five intermediate shaft bearings, and one support bearing which is integral with the thrust bearing housing. The motor rotor shaft is supported by two bearings. An independent assessment and review of the propulsion system overall design, shaft alignment and vibration was conducted. Design modifications were recommended and implemented. 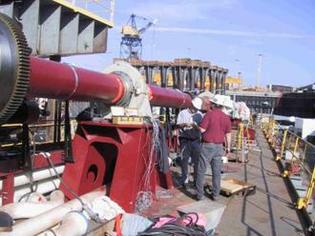 A unique alignment procedure was developed with NASSCO that involved installation of the lineshaft prior to the propeller shaft in “open air”. It was estimated that this procedures saved over 10,000 man hours of work. LamaLo Technology Inc. was contracted to ensure that the propulsion system had a satisfactory alignment condition when the vessel was waterborne and fully outfitted, for all modes of operation, which included the installation of a strain gauge based alignment system. The vessels were delivered in 2003. The alignment performance has been reported to be excellent. 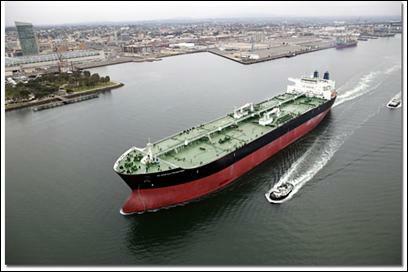 Four (4) BP Tankers were constructed at National Steel and Shipbuilding Company (NASSCO). The vessels are designed for maximum flexibility in the transport of crude oil from Valdez, Alaska, to oil refineries located on the U.S. West Coast. The vessels have a twin screw propeller arrangement, are 287 m long with a design displacement of 221,000 MT, and a rated speed of 15.3 knots at 85% MCR. Each of the 4 bladed fixed pitch propellers are driven by an electric motor rated at 13,400 HP at 85 RPM. The propulsion shaftline is approximately 33 m (108') long, and is supported by two sterntube bearings, one lineshaft bearing, and one support bearing which is integral with the thrust bearing housing. The motor rotor shaft is supported by two bearings. LamaLo Technology Inc. was contracted to ensure that the propulsion system has a satisfactory alignment condition when the vessel is waterborne and fully outfitted, for all modes of operation. This involved conducting a theoretical alignment analysis of the shaftline, establishing comprehensive alignment criteria, developing an installation procedure, measuring and assessing the installed condition. The later is accomplished by comparing the measured alignment condition to the results of the theoretical analysis and the alignment criteria. LamaLo Technology installed a strain gauge based alignment system and conducted the final alignment analysis. Measurements of the alignment condition with the vessel light and loaded confirmed that the alignment condition does not change significantly with loading condition. There have been no alignment issues with all four (4) vessels. Four CV-2600 Philadelphia-Class container vessels were constructed at Aker Philadelphia Shipyard. The vessels have a displacement of approximately 30,000 metric tons and are powered by a 28,880 kW slow speed diesel engine. The propulsion shaftline is approximately 32 m long, and is supported by two sterntube bearings and two line shaft bearings. The thrust shaft has one support bearing between the turning wheel and the thrust bearing. The main engine crankshaft is supported by nine bearings. For the first two (2) vessels of this class (MV Manukai and MV Maunawili), LamaLo Technology Inc. was contracted to ensure that the propulsion system has a satisfactory alignment condition when the vessel is waterborne and fully outfitted, for all modes of operation. Propulsion shaftline final alignment was conducted using the strain gauge technique. The vertical and athwartships loads on the sterntube and line shaft bearings were measured. The shear and bending moment combination were also measured at the thrust shaft flange. The second vessel was delivered in 2004, and the shaft alignment condition has been reported to be acceptable on both the first and second vessels. In the process of completing this project LamaLo Technology Inc. demonstrated that significant cost savings and increased reliability in achieving an acceptable alignment condition can be achieved with the application of strain gauge alignment techniques for shafting systems with Slow Speed Diesel Engines. The MV Jean Anne is a roll on / roll off car and truck carrier, suitable to carry passenger cars and trucks, in the world-wide and U.S. coastwise service, with a displacement of 12,850 tonnes, with a dead weight of 8,850 tonnes. It is being built by VTHalter Marine and will be delivered in 2005. The propulsion shaftline is approximately 22 m long, and is supported by two sterntube bearings and two line shaft bearings. The thrust shaft has one support bearing between the turning wheel and the thrust bearing. The main engine crankshaft is supported by eight (8) bearings. LamaLo Technology Inc. was contracted to ensure that the propulsion system has a satisfactory alignment condition when the vessel is waterborne and fully outfitted, for all modes of operation. Propulsion shaftline cold final alignment was conducted using the strain gauge technique in November 2004. The vertical and athwartships loads on the sterntube and line shaft bearings were measured. The shear and bending moment combination were also measured at the thrust shaft flange. The MV Industrial Chief, and it sister vessel the MV Ocean Atlas, are Heavy Lift Vessels, with a single screw propeller configuration. The four bladed controllable pitch propeller is driven by one diesel engine with a rating of 5400 kW at 500 RPM, through a single reduction gearbox. The propulsion shaft is approximately 6.5 m (21') long, is supported by two sterntube bearings and is connected to the main gear shaft by a sleeve coupling. The main gear shaft is supported by two roller bearings. Premature failure of a bearing on the main gearshaft occurred on the MV Industrial Chief. A theoretical alignment and whirling vibration analysis of the propulsion shaftline was conducted, and the installed alignment condition was measured on both vessels. The alignment condition on the MV Ocean Atlas was found to be unsatisfactory, with unacceptable loading on the main gearshaft bearings. The gearbox was realigned in June 2006, and the vessel has operated without incidence since then. The alignment condition on the MV Industrial Chief was found to be satisfactory and no action was recommended.